Often people limit themselves by not only who they think they are, says Wendy Osefo, but who they think they aren’t. 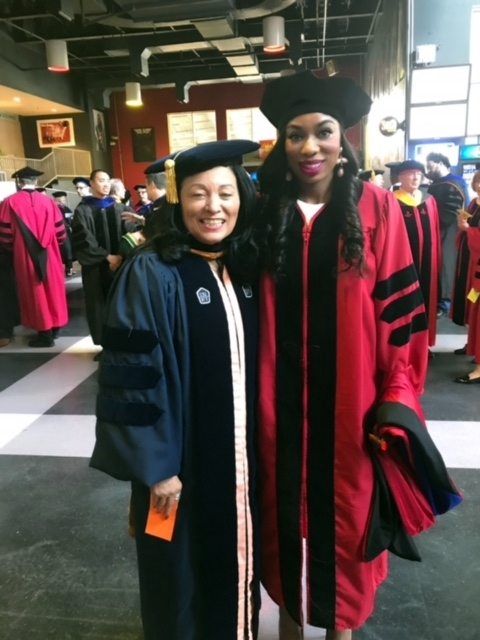 Osefo credits the curriculum of her Rutgers–Camden Ph.D. program for teaching students how to be effective in the real world. With a boundless belief in herself and the unrealized potential in others, the Columbia, Md., resident has quickly gained recognition as a multidimensional force for social change. Among her many roles, she currently serves as a visiting professor of education at Johns Hopkins University and a highly sought-after political commentator. She is also the visionary founder and CEO of The 1954 Equity Project, LLC, a nonprofit that provides resources, tools, and mentorship to underrepresented minority students to succeed in higher education. Every step of the way, she carries Rutgers–Camden with her, says Osefo, whose time on campus began by earning a master’s degree in public affairs with a concentration in community development in 2012. Most especially, she credits the knowledge, experience, and outlook gained firsthand under the tutelage of her advisor and mentor Gloria Bonilla-Santiago, a Board of Governors Distinguished Service Professor of Public Policy and director of the Community Leadership Center at Rutgers–Camden. Bonilla-Santiago, the founder of the LEAP Academy University Charter School – the first charter school in Camden, serving more than 300 students in grades K to 5 – would instill a passion in her for serving low-income students and their families that will last a lifetime. Just as importantly, Osefo says, in Bonilla-Santiago, she saw her future. With Bonilla-Santiago’s guidance and a healthy dose of “tough love,” Osefo focused her doctoral dissertation on examining how the LEAP Academy has engaged its low-income parents to become a national model for success. Parental engagement, she continues, should include the development of parents as a priority, and a collaboration between the school and parent to create a shared vison of what they want the school to look like and how it should function. “Parents should be seen as partners in their children’s educational endeavors,” says Osefo, who also earned a bachelor’s degree in political science from Temple University in 2006 and a master’s degree in government and political communication from Johns Hopkins University in 2009. Osefo (r) poses with her mentor and advisor Gloria Bonilla-Santiago. In Bonilla-Santiago, Osefo says, she found the embodiment of who she wanted to be. While still a Ph.D. student, Osefo was recruited in 2013 to serve as director of Family and Community Engagement, a D.C. Promise Neighborhood Initiative for the U.S. Department of Education. In that role, she oversaw a $5 million dollar budget and implemented best teaching practices that she was learning in her Rutgers–Camden Ph.D. program. It’s a testament, she says, to how Rutgers has designed the curriculum of its program. The post proved to be a harbinger for her future successes. In 2014, Osefo was recruited to serve as the inaugural director of the master’s program in management at Goucher College in Baltimore. During her tenure, the program received several awards in recognition of being the best online, graduate-level management degree in the U.S.
She recalls that, in the wake of media coverage of police shootings involving unarmed black men, as well as the mass shooting at a church in Charleston, S.C., students were traumatized by these incidents. Without answers and anywhere to turn, they were internalizing what they were feeling and needed a platform for discussion. “So I asked, ‘As educators, are we doing everything to provide adequate services to our students?’” she says. Osefo began the project by coordinating group discussions on campus. The discussions are now held at both the collegiate and high-school levels, with Osefo often leading the exchanges. A core feature of the program, says Osefo, is its central focus on mentorship. With her foresight – and a little modern technology – a female surgeon in Maryland now serves as an e-mentor to young students seeking a similar career path in the medical field. “Our mentors come from all walks of life, but they all believe in the mission of our organization and the positive role that they can have in the lives of young students,” Osefo says. Upon graduating from Rutgers–Camden in 2016, Osefo arrived in her current position at Johns Hopkins University. She currently leads several classes that shed light on the politics and power dynamics of education. She received the 2017 Johns Hopkins Diversity Recognition Award for her research on diversity and inclusion. She is also the 2017 recipient of Johns Hopkins Distinguished Alumni Award, in addition to being a Baltimore Business Journal “40 Under 40” honoree, and Baltimore Sun “25 Women to Watch” honoree. Osefo has now been tasked with developing a doctorate-level course called Partnership and Community Organizing Education, which equips educators to be more effective teachers in urban communities. She notes that one of the prospective course readings is a portion of her published dissertation, and Bonilla-Santiago is on the short list of prospective guest lecturers. As she sees it, her Rutgers–Camden education is coming full circle.